Under Action 14, countries have committed to implement a minimum standard to strengthen the effectiveness and efficiency of the mutual agreement procedure (MAP). The MAP is included in Article 25 of the OECD Model Tax Convention and commits countries to endeavour to resolve disputes related to the interpretation and application of tax treaties. The Action 14 Minimum Standard has been translated into specific terms of reference and a methodology for the peer review and monitoring process. The minimum standard is complemented by a set of best practices.The peer review process is conducted in two stages. Stage 1 assesses countries against the terms of reference of the minimum standard according to an agreed schedule of review. Stage 2 focuses on monitoring the follow-up of any recommendations resulting from jurisdictions' stage 1 peer review report. This report reflects the outcome of the stage 1 peer review of the implementation of the Action 14 Minimum Standard by Belgium, which is accompanied by a document addressing the implementation of best practices. 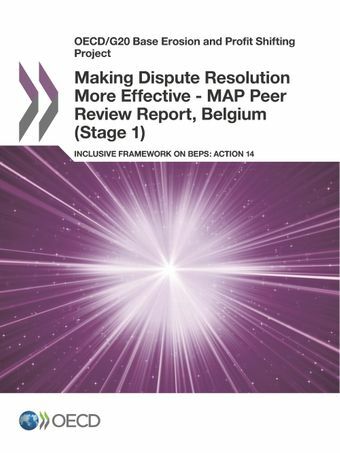 The final report on BEPS Action 14 "Making Dispute Resolution Mechanisms More Effective" identified a number of best practices related to the three general objectives of the Action 14 Minimum Standard. These best practices are not part of the minimum standard and whether or not a jurisdiction has implemented the best practices has not been peer reviewed or monitored, nor has it affected the assessment of the assessed jurisdiction. However, jurisdictions were free, to identify best practices they have adopted and to request feedback from peers on the adoption of these best practices. Action 14 develops solutions to address obstacles that prevent countries from solving treaty-related disputes under MAP, via a minimum standard in this area as well as a number of best practices. It also includes arbitration as an option for willing countries.